When God's standing, sit down. There are many trials and tribulations.. When God’s standing, sit down. There are many trials and tribulations that come against us in this life. However, when you’ve got God, He will fight your battles. But the hardest thing to do, is to let Him have complete control. So, surrender everything to Him and trust that His way is always perfect and the best result will always occur when He is control. He doesn’t need our help, so keep on trusting Him before it, during it and after it. Rest in knowing that when God’s standing, the best thing for us to do is sit down. God will never lose a battle and He will never leave you all by yourself to fight it. Trust Him, Keep pressing and Keep your faith in Him. Have an awesome day. Take care, stay encouraged and God bless you. 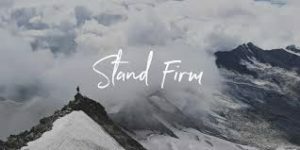 Scriptures for when God’s standing.